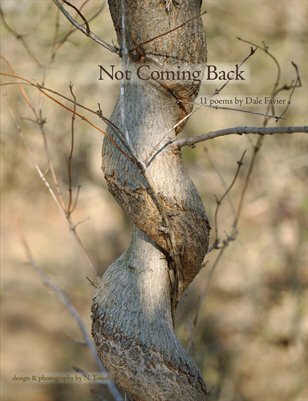 Not Coming Back collects eleven poems by Dale Favier and presents them together with photographs by Nina Tovish. Dale's poetry is direct, revelatory, and generous. He writes of love and other passions, the wounds of time, the ecstatic presence of nature. He tells aloud secrets of body, mind, and spirit in a modern idiom with strong roots in the great poetic traditions. These poems are brave and accessible—and sometimes wry but never flippant or cynical. dropped from a grocery bag. I'm back. As if I'd never gone. Dale writes online at his blog "Mole." Nina's photographs direct our vision to the beauty—both humble and extravagant—in the world around us. You can find more of Nina's photography at "Something Beautiful."